Stolen from her family as a young girl, Scarlett was lucky enough to eventually escape her captor. Now a teen, she's starting a summer job at an amusement park. There are cute boys, new friends, and the chance to finally have a normal life. Thrillers/Mysteries are one of my favorite genres of books. Put it in a YA setting and BINGO! We have a winner! So when the opportunity came along to read and review Never Missing, Never found on my blog, I jumped at the chance to sink my teeth into this story. The book is about a girl named Scarlett. When she was just a young child, Scarlett was kidnapped and imprisoned at a home only to finally escape her captor many years later. Happily back with her family after years of being away, Scarlett decides she wants to try and move on with her life by getting a job and maybe making some friends for some normalcy. She ends up getting hired at a local amusement park but on the very first day of work she finds out that the girl who hired her has gone missing. This news hitting all too close to home begins to worry her that what happen to her may be happing all over again to another innocent girl. With constant flash backs, Scarlett recalls or relives what happen to her from the day she was taken, from the day she escapes her kidnappers once and for all. But what if those memories are not always what they seem.... sometimes the mind decides to block out or even change even the smallest of details of what tragic events happened to us. Scarlett will need to find a way to remember what really happen to her, in turn being the key to finding the missing girl. Of course, nothing is at it seems and the kidnapper may be closer than Scarlett she realizes....so much so maybe even one of her new co-workers or friends. Finding the truth may cost Scarlett her life....but is it worth it? You'll have to read the book for yourself. What I really loved about Never Missing Never Found is the story is being told from a past and present time-line. One chapter goes into what is happening present day and the next focuses on her time while being held hostage for all those years. The reader will learn all the horrifying details of what really happen to Scarlett while being locked away. Until the end where both story-lines meet for the thrilling and shocking reveal, I personally did not see coming... The ending had me thinking, Oh. My. God! What did I just read?! I've read some amazing thrillers in my time but this one was a doozy! For me, the ending can either make or break a YA thriller and in this case, it totally made it, awesome! A few more things i enjoyed about the book were: number 1 - Scarlett's character devolvement from when she was kidnapped/working and making friends up until the ending of the book. As the book begun I knew right away I liked her. She was strong-willed, edging, and but sweet-natured. She held her family and friends close but her memories even closer. You wanted to feel bad for her but at the same time, you knew she would find a way to fight even if it took her a while to do so. I wasn't all that thrilled by the secondary characters besides her love interest and her little sister but that didn't hinder my overall opinion about the book. Another thing I look for when reading any thriller/mystery is if the story keeps me interested throughout the entire book or just select chapters. In this case, I was enthralled the almost whole time. I couldn't wait to find out what happen next, what new memory Scarlet would relive order to help find her missing co-worker. I did have a couple areas of the book that I did happen some trouble with, one being towards the ending. I was confused about what happen at a certain point. I feel the author didn't thoroughly describe what happen. Of course, you wouldn't understand what I'm talking about unless you knew the ending but for me, this point in time could have been explained better. Also while most of the book had me completely engross in it there were a few chapters I feel dragged on and on... Other than that it was definitely a solid YA thriller that i really enjoy reading. As I've never read anything but the author Amanda Panitch, I was happy to have found I now have another new author to add to my favorites. I definitely will be reading more by her in the very near future but until then I so recommend to you all to check out this book. You so will not be disappointed. Totally Awesome! I loved it, would read again. 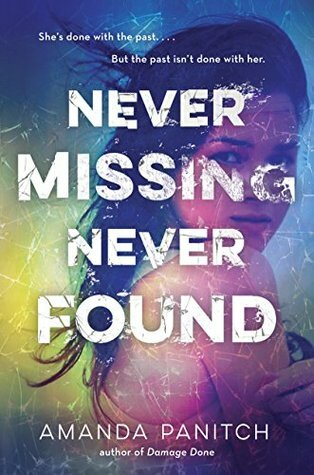 Enter to win a hardcopy of the Never Missing Never Found by Amanda Panitch below using the rafflecopter form. Open to US residents only! Never missing never found sounds like a good mystery ♡ looking forward to reading this book. Thank you for your review. I need to read this book. I'm all about YA Mysteries right now (and trying to find good ones is SUPER hard), and this one sounds super good. Love that the ending lived up to you. That really can make or break the book! Sounds awesome! Thanks for sharing.